India left-arm wrist-spinner Kuldeep Yadav has been included in an 18-man squad announced Wednesday for the first three Tests of their series in England after impressing in recent limited overs matches. The 23-year-old took five wickets in the opening Twenty20 international and then returned superb figures of six for 25 -- the best by any spinner against England in a one-day international --- in an eight-wicket win in the opening ODI at Trent Bridge last week before the hosts bounced back to win a three-match contest 2-1. Kuldeep has made just two career Test appearances to date, the last against Sri Lanka in Pallekele in August 2017. India have tended to deploy the experienced pair of off-spinner Ravichandran Ashwin and left-arm orthodox Ravindra Jadeja as their specialist slow bowlers in recent Test matches. 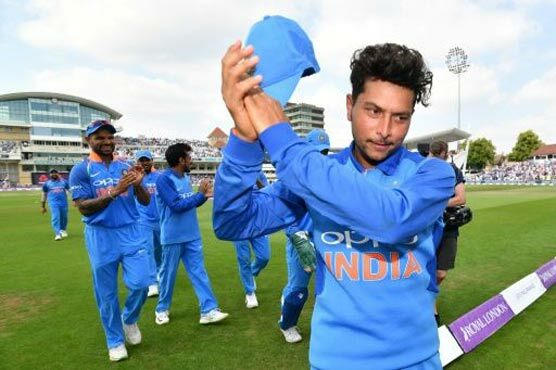 But Kuldeep, speaking after his one-day haul at Trent Bridge -- the venue for the third Test -- said: "Talking about Test cricket, I am hoping for the call and let's see what happens in a couple of days when they announce the Test team." India's selection panel met in Leeds, the venue for England's eight-wicket win in the third and deciding ODI at Headingley on Wednesday, to pick the Test squad. Pace bowler Bhuvneshwar Kumar aggravated a lower back injury during that match and his inclusion is subject to his recovery. Jasprit Bumrah has also been selected but will only be available from the second Test onwards based on his fitness. Top-order batsman Cheteshwar Pujara, who has been playing County Championship cricket for Headingley-based Yorkshire, is also included in the squad. India, who will again be captained by star batsman Virat Kohli, have a four-day warm-up match against Essex at Chelmsford next week before facing England in the first Test at Edgbaston starting on August 1.